Straczynski seems to relish moving Peter out of his element, so to speak. One story even has the hero visiting the desert, which is quite literally outside of his comfort zone. “The problem with the desert is that there’s nothing to swing from,” he explains. While the rest of the fish-out-of-water moments are arguable more metaphorical than literal, there’s still a sense that Straczynski is pulling the hero quite far outside of his comfort zone. The story arc Digger is perhaps the closest to a “traditional” story in The Amazing Spider-Man. 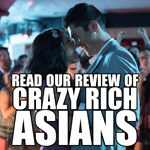 It features a cookie-cutter villain with an origin so stereotypical that it’s handled in the space of a few pages. (Dead bodies + “mass grave for illegally dumping chemicals from several nearby factories” + gamma bomb = instant villain.) It also allows Spider-Man to mess with mobsters rather than demi-gods. 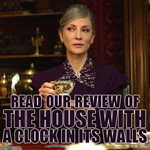 However, the bulk of the story seems built around how outmoded everything is. It’s no coincidence that the character comes from years before Spider-Man was created. 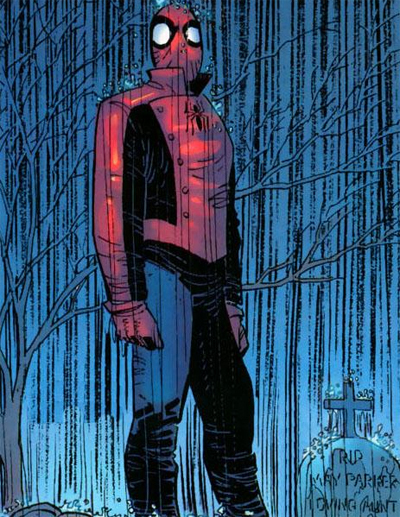 His backwards-looking nostalgia is, to Straczynski, the antithesis of what The Amazing Spider-Man needs. 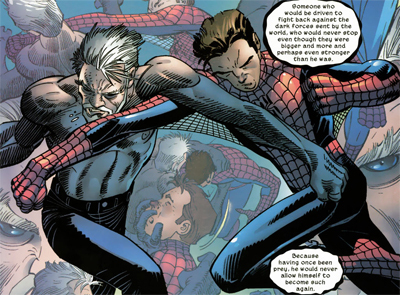 Spider-Man is positioned against Digger, perhaps allowing Straczynski to justify his attempts to update the character and to pull Spider-Man into the twenty-first century by updating concepts and refusing to adhere to archaic models like Digger. 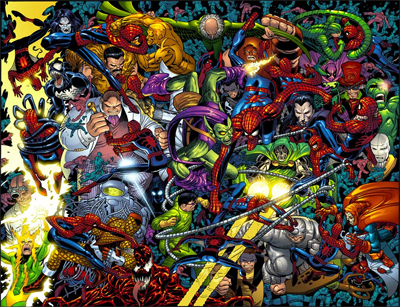 Instead, Straczynski seems to focus on Peter’s place within the wider tapestry of the Marvel Universe. There’s a lot of rather strange and wonderful overlaps between Peter and other random heroes, many of which seem quite surreal whether inside or outside of context. The time-travel adventure of the anniversary issue isn’t brought around by the machinations of Doctor Octopus or the Kingpin. 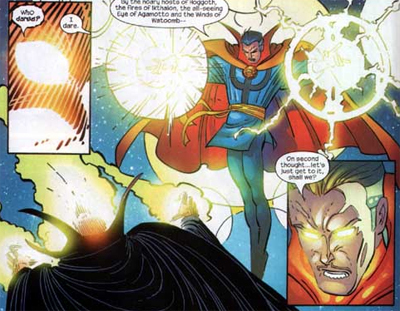 Instead, it’s the Faceless Ones (traditionally Thor bad guys) and Dormannu (Dr. Strange’s arch foe). At an airport, Spidey doesn’t cross paths with the Green Goblin, but Doctor Doom. When a strange new threat forces him into an enemy mine, it isn’t with Venom – but with Loki, Thor’s brother. In fact, the lead up to the five hundredth issue – a pretty major milestone for any comic book – is tellingly not focused around Peter Parker. The issue just before the big event has Peter responding to a massive mystical attack on New York that manages to draw in the Avengers, the X-Men and the Fantastic Four. The big hero of the fight isn’t Peter Parker. It’s Stephen Strange. “Protect the city,” Strange advises his allies. “But leave Dormannu to me.”In any other book, having a guest star step in to hijack the issue directly before a major anniversary would seem weird, but Straczynski actually makes it make sense. That issue, despite not featuring an event revolving around Peter, tells us a lot about him. In a way, it reminds me of those great event tie-ins Ann Nocenti and John Romita used to do on Daredevil during the eighties, where the character would try to help face the big event in his own way – rather than tying into another book or anything. Here, this fight reaffirms something that we always knew about Peter’s character. “No one fights a lone battle in my town,” he vows. And, somehow, that seems like the perfect Spider-Man moment amidst a massive amount of carnage. Straczynzki seems to quite like the idea of contextualising Spider-Man in the shared Marvel Universe, as if to outline his place in the pantheon. Straczynski is not concerned with Spider-Man as the centre of his own universe, but really where he fits within the grand scheme of things. 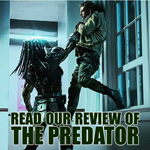 By comparing and contrasting the hero, Straczynski hopes to really define him, and to articulate his role in this impressively vast fictional universe. Some of these ideas are quite ingenious, despite how bizarre they might seem. Teaming up Spider-Man and Loki seems quite surreal on the surface. Spider-Man is, after all, a vigilante who deals with street crime. Loki is a literal god. However, Straczynski brings the two together to inform and colour one another. As Spider-Man himself concedes, “I hate admitting that I can relate to him. We both share the burden of having great power and using it on the periphery.” It’s a thematic idea that feels quite strange… and yet works very well. 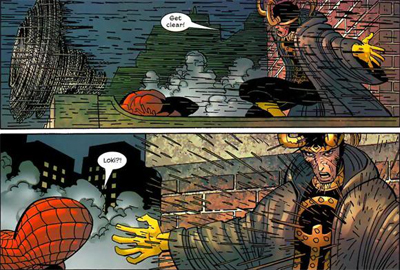 In fact, Straczynski even has the villain Morwen identify Spider-Man as a far more mischievous trickster than Loki. “Spider-Man is a born agent of chaos,” Morwen advises the Asgardian, who looks quite dejected. It’s also great fun to see Straczynski write Loki. The writer is responsible for one of the truly great Thor runs in recent memory, and he seems to understand the trickster god wonderfully well. “Loki, whose side are you on, anyway?” Spidey demands at one point. “My side,” the god responds. Later on, he takes exception to being called a bad guy. “I’m not evil, you vile little creature, I’m… complicated.” It’s great characterisation, and it makes me want to crack open Straczynski’s Thoromnibus again. And then there’s Doctor Strange, who serves as the spiritual touchstone for Peter here, literally guiding him through a magical mystery tour of Peter’s life. While Ezekiel is teased as a trickster mentor to Peter, Straczynski seems to suggest that Doctor Stephen Strange is Peter’s true spiritual guide. The character turns up repeatedly in this short run, and it’s clear that Straczynski has a fondness for him. In fact, the writer was supposed to write a miniseries featuring the character, teased within these pages, that took quite some time to eventually happen. Still, he did go on to play a significant role in Straczynski’s Thor. It still feels strangely appropriate to use Strange in this way as part of the Amazing Spider-Man mythos. After all, Strange was the other major Marvel creation of artist Steve Ditko, the artist who helped create and define everyone’s favourite wall-crawler. With it’s interest in Strange, Straczynski’s Amazing Spider-Manfeels like something of an attempt to strengthen the bond between the two characters who are children of the same father. Of course, this emphasis on the strange and mystical part of the shared universe serves a purpose. 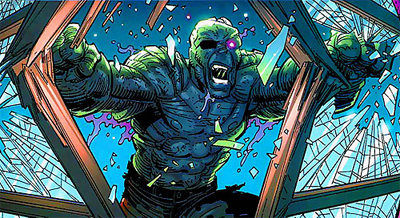 One of the things I do really admire about Straczynski’s run is that – five hundred issues in – he’s not afraid to question one of the most iconic origins in pop culture. I noted last time that part of the reason this works so well is because Straczynski is very careful not to bulldoze over every writer who came before him. Instead, he simply opens the door to the possibility that Spider-Man’s origin might include a mystical element. There are mystical forces at play here, but Stracznski doesn’t force the issue. 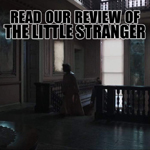 Ezekiel is revealed to more than just a kindly old man, but instead a cynical individual with his own agenda – something that throws everything he says into doubt. 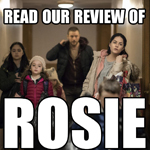 He talks a good game, but the character has a knack for manipulation – notice how we see him carefully play Mary Jane using his observational skills. It’s quite possible that he’s doing something similar to Peter. At the same time, there’s too much supporting evidence – from mystical visions to talking spiders – to completely dismiss everything he says. Peter even flat-out asks, “What’s the truth? The magic, or the science?” He gets an answer that suggests bothare, to an extent – the truth is whatever one chooses to believe. It’s a nice way of toying with an established cornerstone of the mythos without upsetting the apple cart too much. I also think it’s a wry meta-fictional comment on the nature of comic book characters. Written and illustrated by countless writers and artists over the years, with multiple conflicting portrayals, which version of the character is the real one? All of them, or none of them, or some of them? 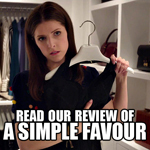 I think that it’s in the eye of the beholder – which interpretation a given fan allows to influence their own internalised version of the character. 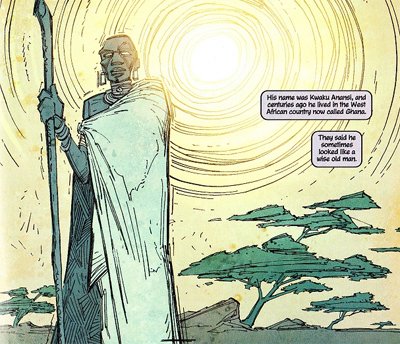 That said, I do think that Straczynski goes a little too far here when he ties Spider-Man to the African spider god Anansi. 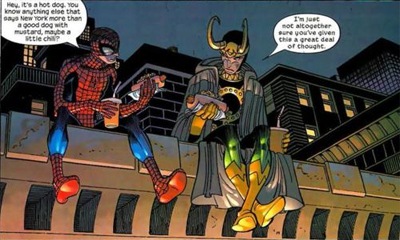 It’s a nice touch – one foreshadowing the bond between Spider-Man and Loki – but it feels perhaps too much. One of the better aspects of Peter Parker is the fact that he’s not a god or a billionaire or a super soldier. He’s just a kid with some spider powers, rather than some body who inherited the power of an ancient god. As Loki notes when he’s approached by Morwen, “Odd that she should be drawn to you. You are inconsequential. Powerless. A mere mortal.” After all, the idea that Peter is the host to an ancient god a little too similar to the character of Donald Blake, isn’t it? Still, I like some of the observations and logic here. 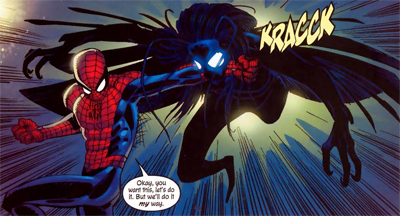 In particular, I like the idea of the spider as a predator, even if it might seem a little counter-intuitive at first. Ezekiel states, “We’re both children of the spider, Peter. Both hunters.” If you think about it, it actually makes a lot of sense, with Spider-Man “patrolling”the city like an apex predator, hunting down criminals through the urban jungle. It’s a nice and inventive interpretation of a classic idea that works really well – and I think it’s touches like this that make Straczynski’s run so interesting, even when it is flawed. Whatever happened to the Spider-Man of tomorrow? 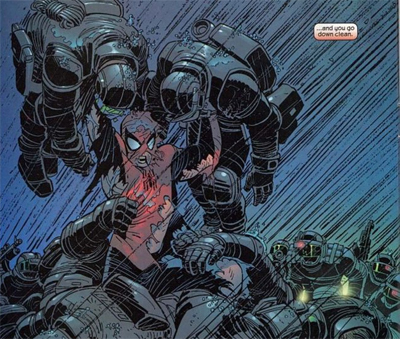 I am also fond of the idea that Peter was given power (or chosen to receive it) because he understands weakness, “because having once been prey, he would never allow himself to become such again.” It’s a nice idea that was cleverly worked into Captain America: The First Avenger, that the weak man knows the true value of strength. It also explains why Peter is still focused on relatively mundane street crime – he chooses to be, because he knows what the people living in the urban environment have to live with. He’s more rooted in the everyday reality of New York life than Thor or Tony Stark. Still, there are some problems with Straczynski’s run. He falls back on some of the same crutches here as he did in the first half – including overplaying the importance and threat of a new foe. Much like Morlun, Shathra succeeds in provoking a rage in the normally flippant hero. “Normally I’d be making wisecracks right now,” he states, as takes her on. “But I don’t.” It feels a little convenient that she seems to take on the same core attributes as Morlun – we’re told she “does not tire, does not stop.” It feels like Straczynski just copied and pasted the character over. There are other awkward moments and touches. While the first half of the run was filled with over-earnest “after school” specials about social problems that Spider-Man couldn’t solve by punching in the face, the second volume isn’t immune to the problem. It feels a little better, because at least the idea is a bit more nuanced than “drugs are bad” and “homelessness is also bad.” Spider-Man learns first-hand about “the Doctrine of Unintended Consequences”, the idea that that his actions can have unforeseen long-term effects. 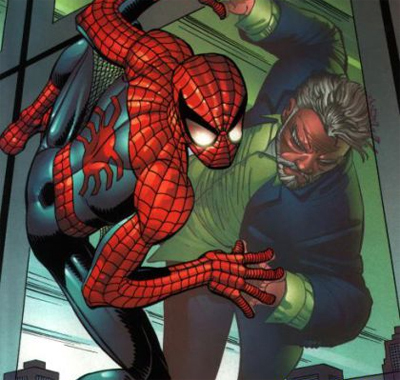 It’s hardly a novel idea, but it fits well with some of the ideas that Straczynski toys with – what happens next, after you accept the basic tenants of Spider-Man? 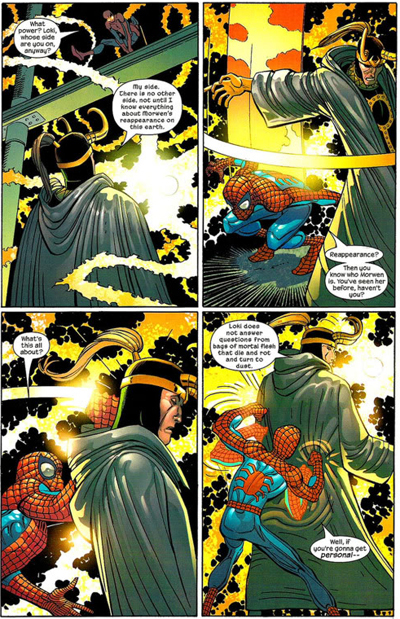 Ezekiel teased Spider-Man about what came after “with great power comes great responsibility”, and here we see the character teasing Spider-Man about the limits of his approach to justice. “To protect the public is to not abandon anyone, you know,” the old man tells him – and it’s a valid statement. The problem is that it’s never really followed up. 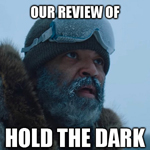 Ezekiel is running this scheme to help people out of prison, and yet he still feels like he has done nothingwith his life towards the climax of the character arc. It feels like mixed messages. It doesn’t help that Straczynski writes the most cringe-worthy “smart people” dialogue that I have ever read. Ezekiel is supposed to be helping prisoners who used their time in prison to educate and improve themselves. Unfortunately, the only way that Straczynski can illustrate that a character is literate is by giving them ridiculously pretentious nonsensical dialogue, as if they swallowed a thesaurus. Knowledge and comprehension are two different skill sets, and self-improvement has to be more than simply regurgitating the dictionary. Straczynski doesn’t show us anything more substantial. There’s also the issue of Mary Jane. 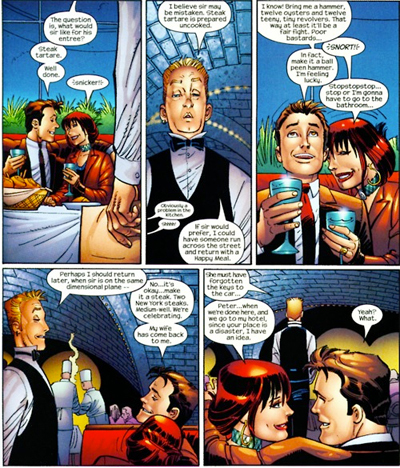 Straczynski brings Mary Jane back into Peter’s life, after spending a significant portion of his run making meta-textual criticisms of how the character is frequently used. 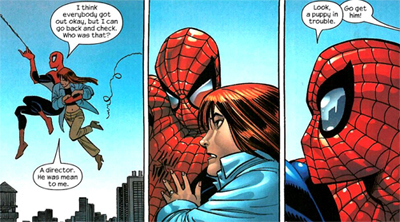 Don’t get me wrong, he creates a wonderful sense of Peter and Mary Jane as a couple, but Mary Jane never feels quite as well realised as, for example, Straczynski’s Autn May. Straczynski seems to make some astute criticisms of the way some writers handle the character, but doesn’t make any real attempt to fix them. Aunt May observes, “You haven’t played a character, MJ, you’ve only played things that move the story ahead.” It’s a valid criticism of how some writers have used Mary Jane, but the problem is that Straczynski doesn’t quite fix that problem. Maybe the best is yet to come, though. He shifts Mary Jane’s goals from the shallow “I wanna be a star” to the more sincere “I wanna be an actress”, so maybe the true development for the character is all being seeded here and will pay off down the line. 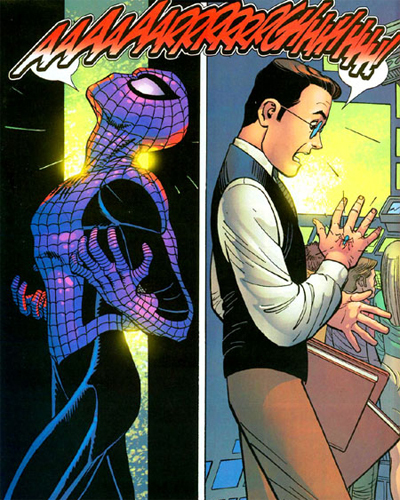 I also think it’s worth pausing to reflect on how well Straczynski writes Peter Parker’s inner voice. His monologues and his dialogue are all wonderfully cheeky and witty. 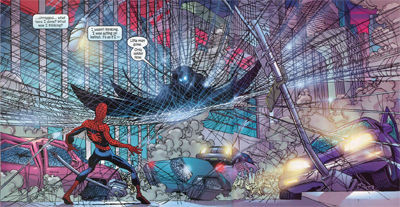 The writer has a great grasp of Peter as a character, particularly his wandering mind. 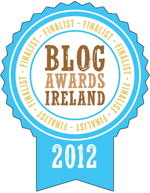 Highlights include Peter wondering about superhero insurance cover, and even worrying about worrying too much. He even takes the time to help his foes correctly spell his name. “Note the hyphenated form,” he advises Digger. There’s a wonderful sense of fun in these issues, and it’s something that would fade from the series with the tie-ins to Civil War and everything else going on. “How do you do that?” an airport security guard asks Doctor Doom at one point. “Speak in all capitals like that?” At another point, we pause to join Loki and Spider-Man eating some hotdogs on the rooftops of New York, a rather absurd and yet cheerful sight. I remarked earlier that – had the run ended here – I think it would be regarded as one of the truly great Amazing Spider-Man runs. Sure, there are dangling plot threads left (Mary Jane’s career, the bad future), but most of the balls set in motion by Straczynski’s opening arc have been neatly tidied up. So neatly tidied up that they’ve have to be messily resurrected for the upcoming The Other crossover. In fact, I am still hugely fond of these issues, even knowing the creative turmoil lying ahead. John Romita Jr. continues to be the perfect penciller for this run. Although the decline in quality after his departure would arguably be down to a host of other factors, I still think that Romita’s artwork really made the title what it was, effortless blending the fantastic with the relatively mundane with tremendous skill. Nobody goes from illustrating Asgard to the Bronx with as much ease as Romita. I know his artwork is divisive, but I am a massive fan. And so, this section of the run is over. After this point, things get a bit messy. Then they get a lot messy. Still, Straczynski and Romita Jr. delivered a rather nice (albeit flawed) run on The Amazing Spider-Man. It doesn’t quite measure up to other series at the same time (like Morrison’s New X-Men or Milligan’s X-Statix), but it is very engaging and very interesting stuff. I’m not sure it would rank as my favourite Spider-Man run, but it is perhaps the most ambitious. And I think that’s really something.